There may be occasions when you want to modify an existing gift card. This is not advised under most circumstances since it bypasses the built-in functionality and tracking of gift cards. Go to Gift Cards a bring up the gift card to modify. Click "Edit Status/ Expiration Date/ Delete" to change those settings. 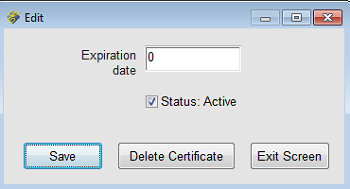 When the Edit window opens you can enter an expiration date, click or unclick "Status: Active", or delete the certificate. Click "Manual Detail Entry" to add additional funds to a card when you are not receiving payment for those funds, or to reduce funds when you do not wish to post a charge or payment code against this. Note that manual detail entries to not create charge or payment transactions and should be used only when making corrections, etc. For example, if your network lost communication during a gift card sale and the card does not reflect the correct balance, you can use Manual Detail Entry to correct the card. 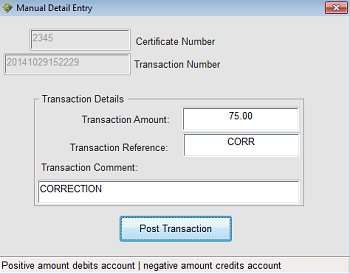 Note that it corrects the card only and does not create any charge or payment transaction. You may receive a prompt for an admin code. Your manager should be able to provide this information. Execu/Tech may provide the code to a known (on record) manager, owner, or administrator, at Execu/Tech's discretion.